Smart, Stylish, Classy and New, the chic San Diego Marriott Gaslamp Quarter is a full-service, high-rise hotel near the heart of downtown San Diego. Tailored for groups, our facilities include one main ballroom and a variety of meeting and banquet rooms. Superbly equipped and set to your precise specifications. We have the facilities you have come to expect at an exceptional meeting destination. Indulge your appetite at our signature restaurant, Soleil @ k or relax in Altitude Skybar our rooftop bar soaring 22 stories above downtown with sweeping views of the ocean and skyline. Our in-house catering team will work with you to craft menus that go above and beyond to impress clients and guests. From intimate private dining engagements to elegant weddings and social events to large-scale corporate gatherings, our catering team can handle it all. Planning a grand affair? Discover the best ballrooms and banquet halls in San Diego here in our hotel. Our larger venues – which include more than 8,000 square feet of total Gaslamp District event space – include the expansive Cabrillo Ballroom and the adaptable Presidio Ballroom, perfect for bigger celebrations. Enjoy bold flavors, innovative cuisine and custom menus by turning to the San Diego catering service at San Diego Marriott Gaslamp Quarter. Atmosphere/Decor: Our downtown San Diego meeting spaces were made to host an array of meetings – from intimate business meetings to industry conferences to weddings, social events and everything in between. 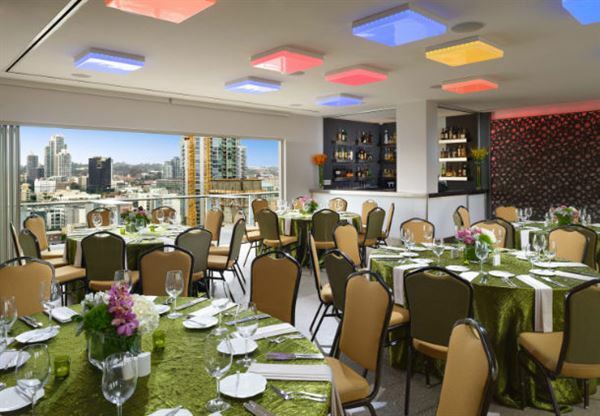 Atmosphere/Decor: With modern AV equipment, hands-on personal service and flexible layouts, San Diego Marriott Gaslamp Quarter is the perfect place for productive corporate gatherings and memorable affairs.